Click here to view my review of The Bottom. 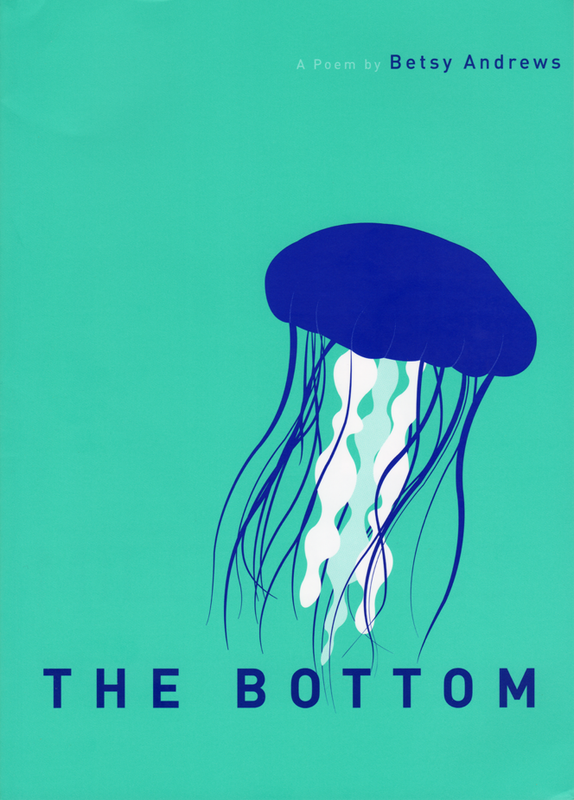 Betsy Andrews’ book-length poem, The Bottom, was published by 42 Miles Press in 2014 and received the 2013 42 Miles Poetry Prize. Sections of this poem appeared in such places as Kadar Koli, BoogCity, Stone Canoe and The Laurel Review, as well as Poets for Living Waters. In the following interview, I discuss with Betsy her thoughts on her writing and research life, the process behind The Bottom, and what she is working on now. I found her responses to questions about her favorite writers, and the influences for this book, and her overall process to be extremely compelling. I really feel I’ve learned a great deal from her, from reading her work and thinking of how her process applies to that work. I hope you find her thoughts here to be as rich and original as I did. MLT: Hi Betsy! Thank you so much for taking the time for this interview! There have been a few questions that have been stirring around in my mind about craft and the realization of this book, ever since I first read The Bottom. BA: Thanks, McKenzie. It’s a pleasure to speak with you about my book. BA: Well, first we have to define what “to write” means. My work is very research-based. As I hope the “Tributaries” section in the back of the book shows, I do a ton of reading and note taking, scavenging facts and quotes and language from a huge range of sources—everything from the Oxford English Dictionary to the New York Times (the entire paper is fair game, even the Sports section) to Barbara Walker’s Women’s Encyclopedia of Myths and Secrets to books on Marine Biology, ocean myths, sea shanties, you name it—and I always say I am writing, even when I am just in the reading and research phase, because that work is so inextricably a part of what I do. That research I can kind of do anywhere: at my kitchen table, in my home office, on the subway, in the library. Writing also happens anywhere in small nuggets in the notes app on my iPhone: on the beach, the street, the couch, whatever. But the actual creation of lines across the page, and those lines building into something that turns into a page in the book, well, that has to happen in quiet solitude. Sometimes it’s at home, but more often it’s on a writing residency, either a formal one or a self-made one, when I have a decent chunk of time (say, at least two weeks) and no other distractions except for nature, hopefully, and I can just really make a poem. I am fortunate to be able to do that about once a year, but no more than that. So it takes a long time for me to make a book. BA: Well, there are many layers of narrative interweaving in this book. First and foremost, there’s the story of the dessimation of the oceans. After my first book, New Jersey, which is a book-length anti-war meditation on the New Jersey Turnpike. It was after George W. Bush was re-elected, and I thought, “My gosh, what’s next?” I figured it would be the environment, a wholesale flushing of nature down the tubes. So, as a scuba diver, my thoughts went to the ocean, and I started The Bottom. At that point, I had decided that I was going to write a series of book-length poems engaging the elements: earth (which was New Jersey, the road trip book, the land-based book), water, air, and when I’m older, fire. I was on residency at Djerassi, east of Half Moon Bay in northern California, and I spent a lot of time walking on the beach. There were so many dead seals and sea lions on the shore, the victims of tangling in fishing nets, and also of complications from domoic acid toxicity, which comes from agricultural run-off. I became a supporter of the Marine Mammal Center, in Sausalito, California, which rescues and rehabilitates injured and distressed marine mammals. And I read marine conservation biologist Callum Roberts’ The Unnatural History of the Sea. And I went sailing with my partner and kid and my partner’s dad, which I try to do annually, to the Channel Islands. And all of those things became the foundation upon which the ocean story was built, upon which I layered so much other research and thought. There was also a love story—the story of my relationship with my partner, Jeanne Baron. And an elegy, not only to the seas, but also to my dog, Tai, who had died. My grandmother makes an appearance, poets from Anne Sexton to Yeats get riffed on, there’s astrophysics in it, etc. etc. MLT: How long did you work on this poem? MLT: Book-length poems have always fascinated me. What did your process look like for this poem? How did your process differ in writing a book-length poem, rather than a collection of poems? BA: You know, I sort of decided to write book-length poems because I wasn’t exactly sure how to put a collection together, truth be told. The book-length poem, where the strands of narrative and consciousness and experience and emotion and meaning interweave to create one long, complicated braid just felt right to me, natural and organic. The collection of individual poems always has felt like a much more uncertain and less-organic project. So the book-length poem for me feels easier in a way. And I love the way I can pace a long poem, with characters coming in and out, and various stories intersecting. It’s really fun. And, afterwards, when I re-read it, I discover all these things that I myself didn’t even know were there. It’s a great and mysterious process for which I always say “I never know where I’m going, but I always know where I am,” which is just another way of saying how important craft is. I start by researching and musing and hearing snippets of conversation and whatever. I collect. I collect and collect, and I end up with hundreds of pages of notes. And then I start to squeeze those notes, condensing them down and down, grabbing bits of language and riffing on that language and changing it. I use the OED and a thesaurus and a rhyming dictionary as much as I use source material, because those tools help with discoveries, too. It’s really fun, actually. And then I write page by page. Usually I have the beginning and the end written first, and then I go on a crazy voyage in between on my way to my final destination. I construct each individual page of the poem as a complete work in and of itself. But through the construction of each page, themes and characters and narratives emerge. And those come up over and again. But what drives the poem forward is music, for me. I sang as a kid. I still sing for myself and my family now, pick up my ukelele and sing. And I hear the poem in my head. I hear the language. It sings itself in my head. So rhyme and rhythm are so, so important, especially in this book that is about the sea and so should, of course, have sea songs in it. It should have sailor songs and siren songs and whale songs and gull songs. Then when I have all those pages, I start to order and re-order them. But, in actuality, the final book is very nearly the order I wrote the pages in anyway. MLT: I also noticed many instances of isolation in this poem—emphasis placed on one single conscience, one jellyfish, etc. This reminded me of the sheer vastness of our oceans, but also presented an irony of how busy some areas of our oceans are. Was this use of isolation intentional? What was your thought process in isolating these personas? BA: I think you pretty much said it. Though the mermaids are never isolated. They are always the mermaids, a plurality. They are, in that sense, all women, and they represent the way women are endangered in a world where nature is endangered, but also the way we are empowered in our connection to nature. In terms of the other creatures and their isolation, I have mentioned the Marine Mammal Center. What I like about their work, though I also support many advocacy groups doing great work for the oceans, is that the Center recognizes that the endangerment of animals entails the suffering of individuals. I think if we realize that it’s individuals we’re harming, maybe we will be more in touch with our empathy and, therefore, our need to act more responsibly. MLT: What are you working on now? Anything new we should be on the lookout for (publications, etc.)? BA: I’m working on the next book in the series, which is about the air. There are a few short poems about birds, which have come out of my initial thoughts and research, coming out this month in White Wall Review. MLT: What do some of your new poems focus on? How do you think your next collection might compare thematically to this one? Might we expect another book-length poem at some point? BA: Yep, it’s a book-length poem about the air. So it will include everything from birds and bees to drones and bombs and spaceships. But I’m not sure about the form yet. There was something about the sea that elicited very long, rolling, wavy lines and singsong rhymes and actual singing. I’m not sure what will happen with air. MLT: Thank you again, Betsy, for taking the time to discuss The Bottom! I can certainly say that I love this poem and can’t wait to see where you go next. BA: Thanks a million! That means so much to me. Below, Betsy has shared her poem, “Prospect,” which is a few years old and originally appeared in Canarium, out of Columbia University. She explained that the poem was “a bird poem [and is] a taste of things to come.” Enjoy! It starts with a duck. dragonflies and damselflies, a stab at transporting moments. he’s lush and naturalistic. He gleams his tiny gleaming. He gleams he gleams he gleams. The army slides its red ears on. The army is fiercely nostalgic. the warp and woof of nostalgia. a white duck rushing full-tilt. fences the bedraggled middle of the decade, orders up heavy machinery. dazzled. The army sinks into the records. the white duck approaches for meaning. The king has the humble valleys disrobed, the king conquers the wind caves. Nobody says a word. They stare. All at once, the flashcubes are popping. Four thousand tadpoles grow up and croak. The tenacious earth clings to its dogwoods and yews. The king is x-rayed for bullets pell-mell. Time is not kind to the gatehouse. as the weight of their own limbs pulls them asunder. The king cuts the weather to ribbons. He sighs. The army will winter over. she asks plain-spoken, that your duck might be a goose? a vagrant, a tin-cup philosopher. The king coughs an enchanting cough. The army pounces upon it. so as to occupy the smallest of spaces. The dictionary is announced to the world. Next Betsy Andrews to Read at IUSB This Wednesday! !